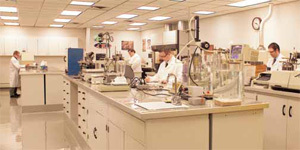 The company’s research and development facilities are staffed by specialists in every facet of synthetic lubricant technology. The chemical and engine-test laboratories are wellequipped with the sensitive analytical instruments needed for design and development of the world’s finest oils. 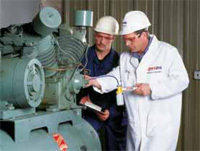 Quality assurance test procedures are rigorous and begin with analysis of every raw material that enters the plant. 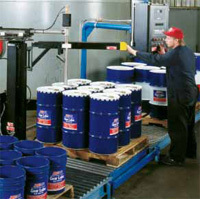 Both during new product development and as a continuing control on the manufacturing process, AMSOIL lubricants are subjected to an exhaustive series of standardized industry tests, including those that measure film and shear strength, flashpoint, volatility and high- and low-temperature viscosity. No other lubricant manufacturer in the world matches the high quality standards set by AMSOIL, and all AMSOIL synthetic lubricants exceed the industry’s most stringent specifications by a wide margin. EVEN THE MOST COMPREHENSIVE LABTESTING MUST BE VALIDATED IN THE FIELD. AMSOIL products are proven in intensive field demonstrations involving automobiles, trucks and commercial and industrial equipment in real-world service situations. Long-range studies have involved vehicles requiring the most severe lubricant applications: taxicabs, delivery fleets, police and emergency vehicles, over-the-road transports and heavy-duty construction and industrial machinery. Results of tests performed under these extreme operating conditions demonstrate that AMSOIL products reduce engine wear, decrease maintenance time, maximize fuel efficiency and increase fleet cost effectiveness. AS OUR WORLD STRENGTHENS ITS ENVIRONMENTAL POLICIES AND GRAPPLES WITH POLLUTION ISSUES, the ecological wisdom of using synthetic lubricants becomes obvious. AMSOIL synthetic motor oils outlast regular petroleum-based oils by as much as 11 times. These remarkably long drain intervals help ease the world’s waste-disposal problem: users of synthetics simply have much less oil and fewer plastic containers to deal with. The combined use of AMSOIL motor oil, AMSOIL Ea Air and Oil Filters and engine oil analysis greatly extends oil change intervals. The superior lubricity of AMSOIL products means much less friction, drag and wear on critical engine parts. The resulting improvement in fuel efficiency and reduction of emission levels contribute to the conservation of natural resources and protection of the atmosphere. Additionally, AMSOIL has made the technology of biodegradability a top research priority, with encouraging recent successes. AMSOIL INC. is determined to meet the challenge of the lubrication industry’s environmental responsibilities head on. Our long-standing quality products lead the way to a greener, healthier planet for the next generation.
. . . to meet ever-increasing demands of transportation, manufacturing and industry. The use of high-quality synthetic lubricants to meet these demands has grown steadily. However, tomorrow’s needs will be different from today’s. AMSOIL INC. anticipates these needs and will remain on the leading edge of new developments. As engineering and automotive technologies progress and generate higher-performance machinery, it is certain that synthetic lubrication will be the ONLY choice for most applications. AMSOIL will maintain its Commitment To Excellence and continue to set the standards by which other lubricants are judged.